• Empty egg cartons. Instead of tossing these into the recycle bin, consider their possibilities for reuse. For example, in each cup of an egg carton you could freeze individual cookie dough batter, meatballs or individual portions of other food items, to keep them from becoming a solid, frozen mass. Young children will enjoy Jell-O molded in egg cartons to create treats. Or, start your spring seedlings in egg cartons, instead of in small plastic pots that may or may not be recyclable. • Mismatched socks. Old and mismatched socks can serve multiple purposes. You can use them to keep your children’s small toys organized, instead of risking stepping on them, sending the unfortunate victims to the toy graveyard. Storing adult odds and ends (screws, nails, paper clips, etc.) is another option. Indoor painting on the horizon? Protect your shoes by covering them. • Paper towel rolls. This versatile performer is great for keeping your plastic bags under control, by stuffing them inside. Tired of untangling extension cords? Paper towel rolls can control their annoying behavior. Also, use them to organize you or your daughter’s hair bands and clips, on both the outside and inside of empty rolls. • Shoe and sneaker boxes. Most are well constructed and make wonderful storage bins. Whether to organize shoes in your closet or to store household or workshop items, you’ll be pleased with the result. Try covering the boxes with wrapping paper for a cheery look. • Corks. 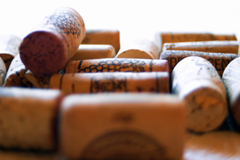 Wine and olive oil corks have multiple uses. Use them to make a floating keychain, to keep your keys safe when boating or swimming. You could even make a corkboard for messages and reminders. The best part is, you can do all of these recycling activities with your children or grandchildren. Not only will it help stimulate creativity and teach how easy it is to recycle common household items, but the kids might have some inventive ideas themselves. Living green can be fun. Our planet will thank you.